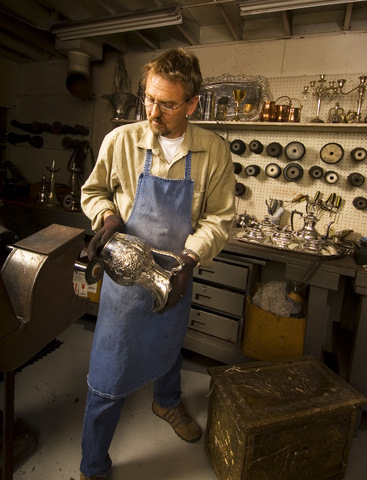 Thompson plates silver and gold, refinishes brass, copper and pewter, and fixes everything from tea sets and trophies to flatware and candelabras. For example, if a silver teapot comes in with a broken handle, he straightens the handle, puts it back on the pot, solders the break, and does touch-up work until the repair isn’t noticeable". Phoenix Magazine May 2007, Monica Skrautvol. Use liquid polishes to bring the shine back to silver. Silversmith gloves also are a good choice for polishing, but stay away from home remedies such as lemon juice mixed with salt. They often are quick fixes, but sometimes are damaging in the long run. Polish silver three to four times a year to keep it from looking drab. Heat doesn’t affect silver, but moisture does; so store your pieces in a dry spot. If you keep them in an enclosed area, like a china cabinet, place camphor squares inside—found online or at silversmith shops—to fend off tarnish. To avoid stains from food or drinks, neutralize acids by washing the pieces in baking soda and warm water after use. Wrap silver in flannel, white tissue paper or Silver Keeper™ bags. Don’t use plastic wrap, as it may stick to the silver. Do not put silver flatware in the dishwasher. The heat is too intense, and detergents can be harmful.